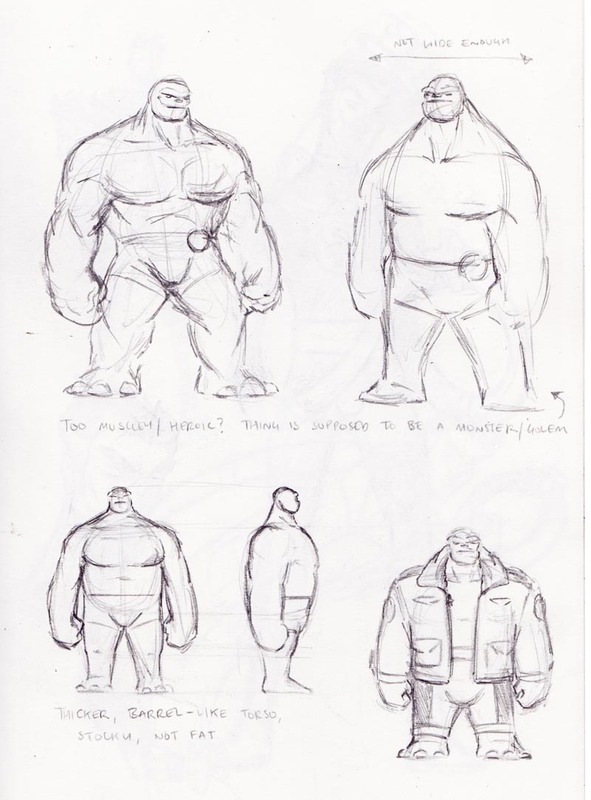 As always, click on the image to enlarge, this may help when trying to read my hastily scrawled notes, or if you want to look at one of the alternative FF logos or even just fancy a better look at Reed’s equipment… *cough* (warning: I forgot to resize one of the Invisible Woman roughs, as well as one of the Human Torch’s, so they’ll be quite large). 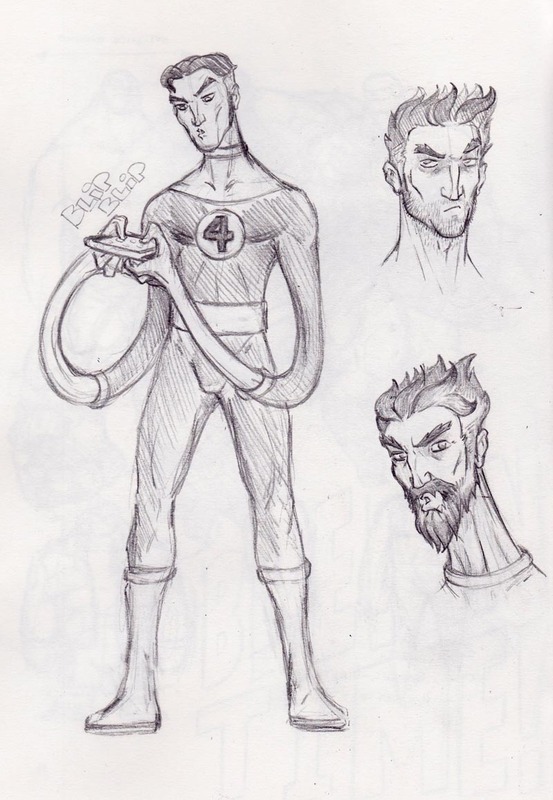 The most recent competition by online nerd-mecca Project: Rooftop was to redesign the costumes of the Fantastic Four. 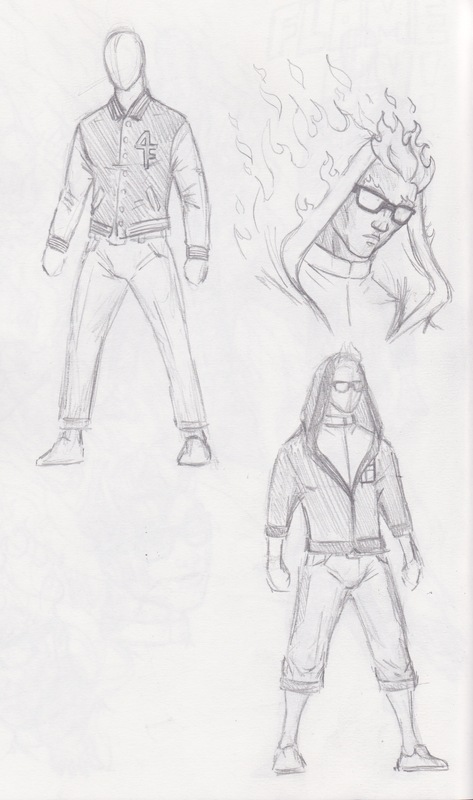 I was really excited by this project, as redesigning Invincible for their previous competition was a lot of fun, and after somehow making the ‘honourable mentions’ list, I thought I would see if I could better myself. 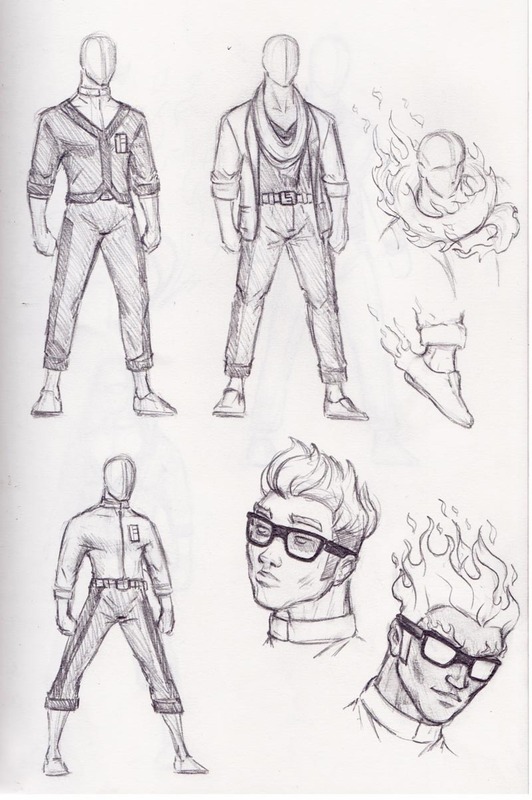 After putting it off for the standard amount of time, I set to work sketching and researching the individual characters to see what they might WANT to wear. 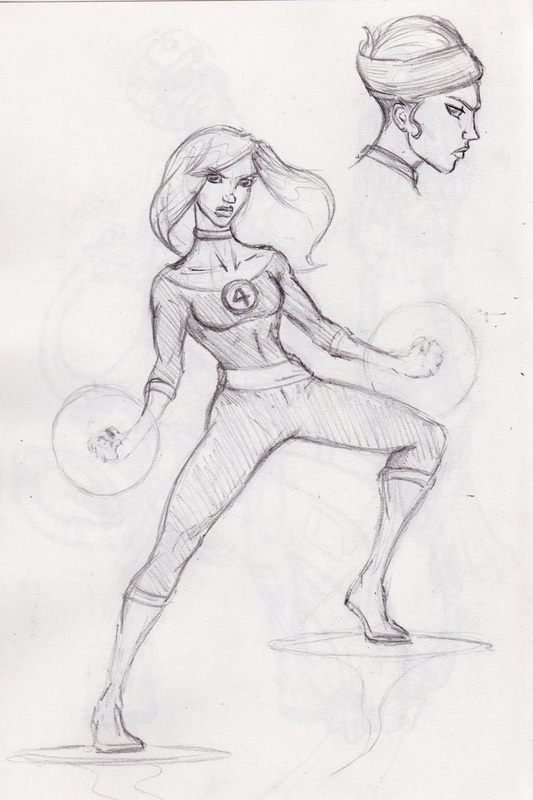 Dogged by some difficulty with proportions (I really need to get back into the swing of superhero form and posture) I was started to get somewhere on holiday, and by the time we got back I had a hundred ideas, and four really solid ones. Unfortunately by that time there was a LOT of over-time going at work, and I am literally too broke to turn it down. As the deadline approached and my free time disappeared, it seemed pretty clear that I wasn’t going to make it. Even with the deadline extended by a week, the project seemed doomed, and with my knackered old PC finally giving in, and an unfamiliar version of photoshop to deal with on my laptop (therefore having to deal with a time-consuming learning process), it was the final nail in the coffin for the competition. Still, by that point I had put too much work in, so I’ve been finishing it off on my days off ever since. Reed is an Inventor, and seems to come up with some new gizmo every week. Unlike Tony Stark however, he doesn’t sell his tech to the highest bidder – instead their funds seem to come from their celebrity status or some mysterious trust fund (weren’t the Storms rich?). However the recession has hit everyone hard, so Sue Storm (the Invisible Woman) suggests selling some of his inventions to earn some extra capital. Reed reluctantly agrees to share his Fantasticar technology with the US Airforce, under the proviso that Ben Grimm (The Thing) keep an eye on things. 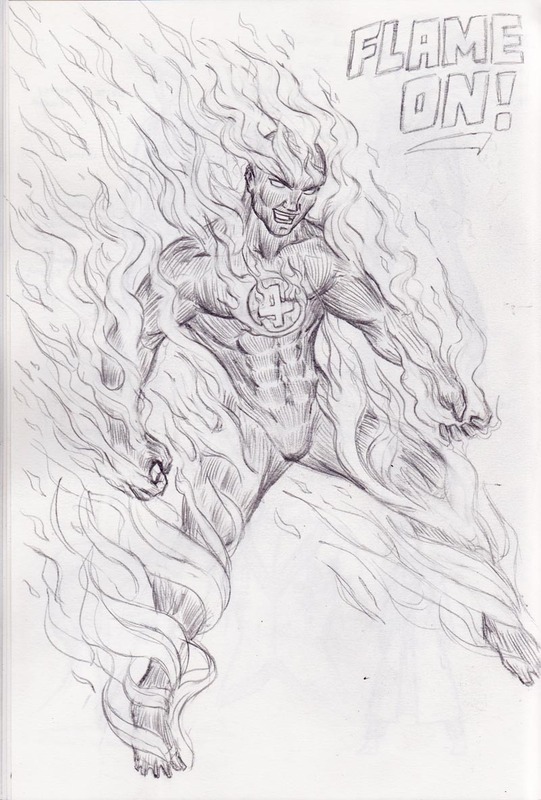 He also agrees to hand over the patent on his ‘Unstable Molecules’ clothing technology to Johnny Storm (The Human Torch) so that he can start his own clothing brand of highly fashionable, yet easily adaptable and durable clothing. The thinking here was that it would finally give Johnny something to do where his strengths lie, it would earn money for the group/brand, and it was in his contract that he MUST supply this durable/adaptable to the homeless, or mutants that need it once every month. 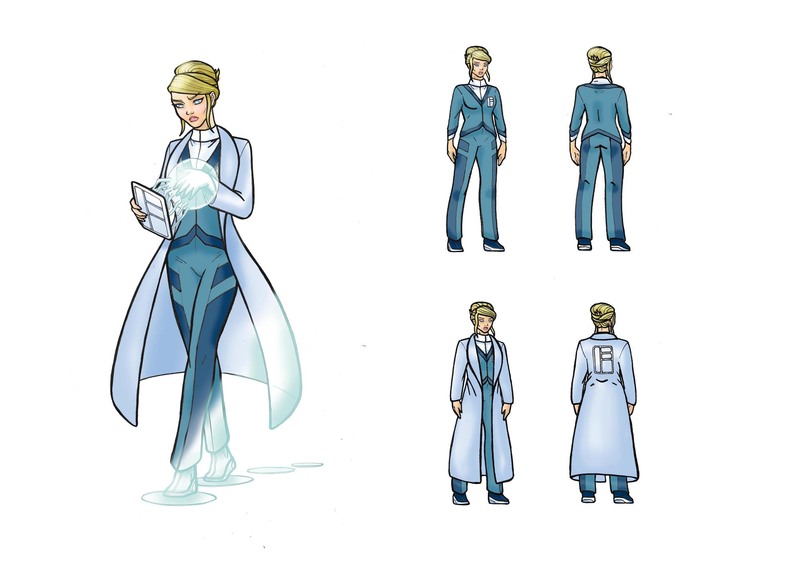 Sue Storm takes control of the business side of things, and therefore has less time to spend with Reed. With Sue not around so much to keep him grounded, Reed becomes increasingly lost in his own work, forgetting to shower regularly or shave, giving him a slightly wild, unkempt look. With Reed’s costume I wanted to highlight the fact that as he can stretch, there’s literally no part of his body he can’t reach, and therefore I overloaded him with straps and a high-tech back-pack – this doesn’t need to look the same for each comic, and in fact would be better if Reed ‘packed it’ with technology he thought would be relevant to the mission/some new gizmo he wanted to try. 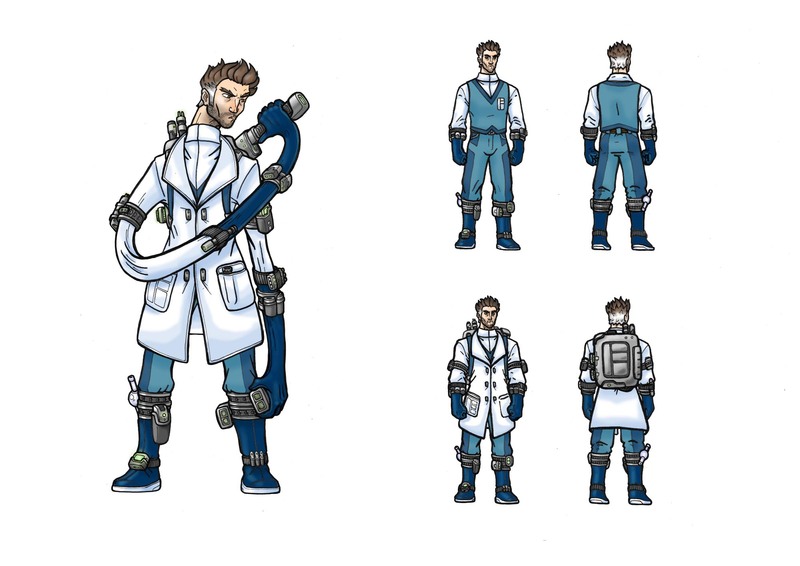 The uniform Johnny designed for him is meant to resemble a college professors shirt and waistcoat combo (to go with his fuddy-duddy attitude), complete with white scientist jacket to complete the look. As a traditionalist, and a pragmatist it was Reed himself that insisted he keep the old-school gloves and boots – they were more practical. Because Sue is now head off the FF brand, she becomes much more focused and business orientated. 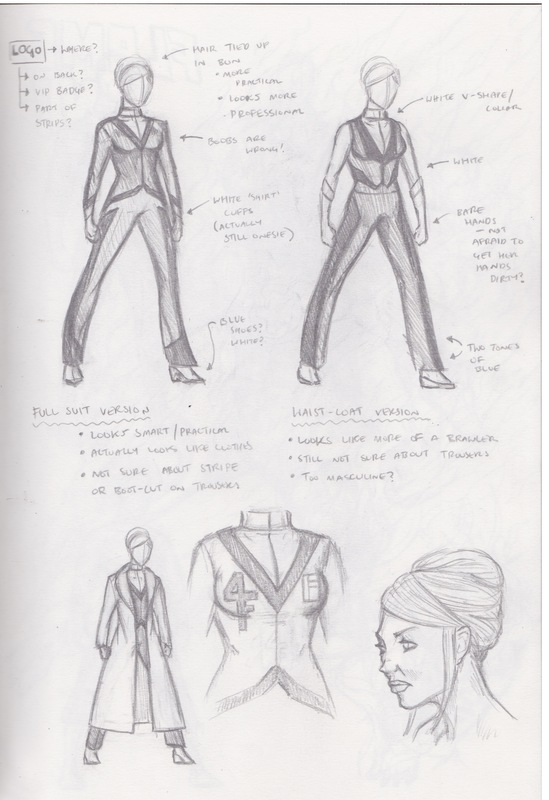 Her costume resembles a lady’s trouser suit, and her hair is always in an up do these days – it just looks more professional. 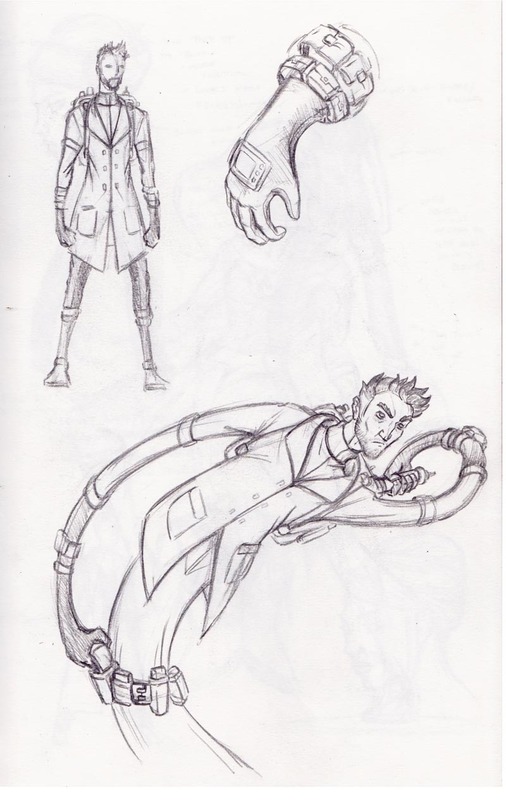 I wanted to give her a long coat, as I thought a) it goes with her new ‘business woman’ look and b) it would look really cool with her invisibility powers – it would appear as if she were floating around like a ghost. Ben spends a lot of his time at the recently reopened and refurbished Mitchel Air force Base, New York, where together with some of his old air force buddies and contacts from Nasa they work to design new fighter jets based on Reed’s Fantasticar designs, and train the young pilots chosen to fly them. 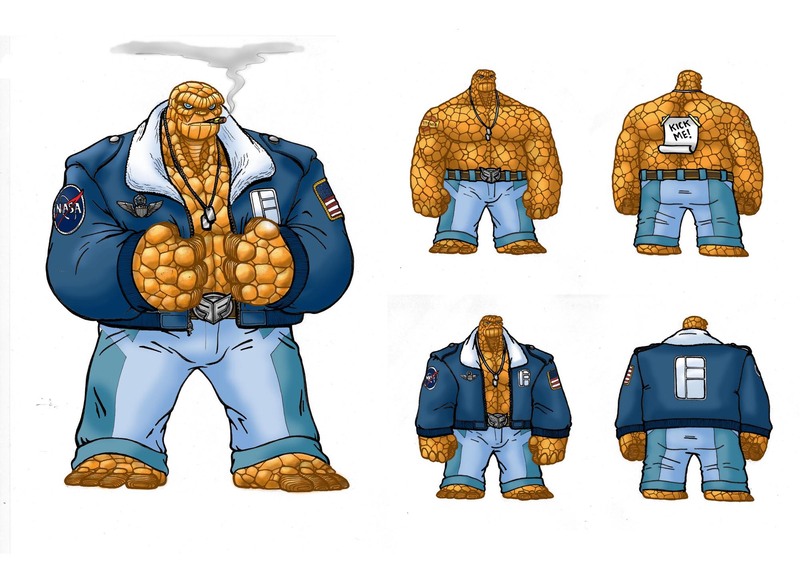 Requesting that Johnny design him something a little more suitable, Johnny creates a large, replica of an Air Force Jacket, complete with various patches to showcase his military background – even an FF belt buckle styled after the USAF Logo. 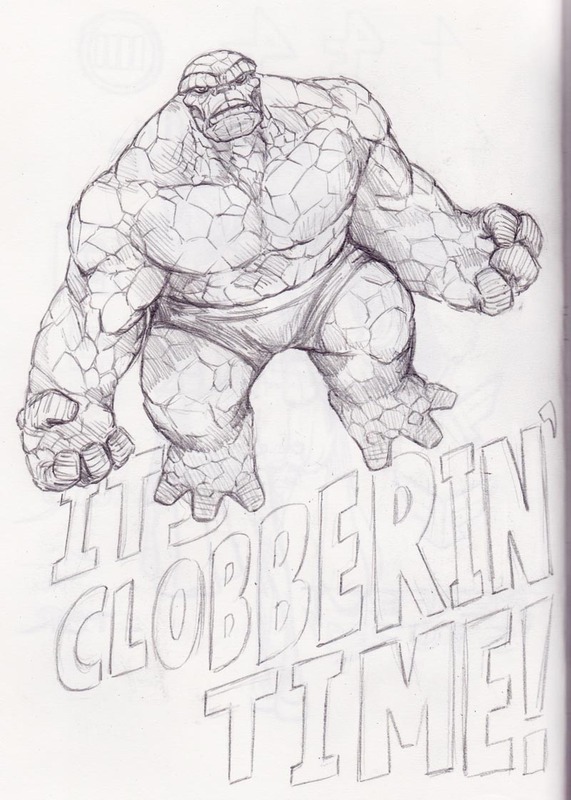 Ben Loves the Jacket so much, he’ll take it off before charging into battle, usually shrugging it off to his famous catchphrase “IT’S CLOBBERIN’ TIME!”. A practical joke Johnny likes to play is to stick a note to the inside of the jacket, so whenever he does take it off, it’s there for all to see, stuck on his back where he can’t reach – this could be a running gag in the comic (a different insult every time). Capitalising on the FF brand, Johnny converted the bottom floors of the Baxter Building into a Perfect Storm Store, and refusing to ‘live above a shop’ lives in a huge apartment over-looking Central Park. I went through several Logo designs, and this one seemed to fit best. The logo comprises of four blocks that are arranged into an ‘F’ – the shapes of the blocks also correspond to the powers and sizes of the four superhero’s – 2 are the same size, one is the same width but stretched out, and the last is a large, solid block, and I’ve coloured one of the logo’s in the style of the individual to highlight this. 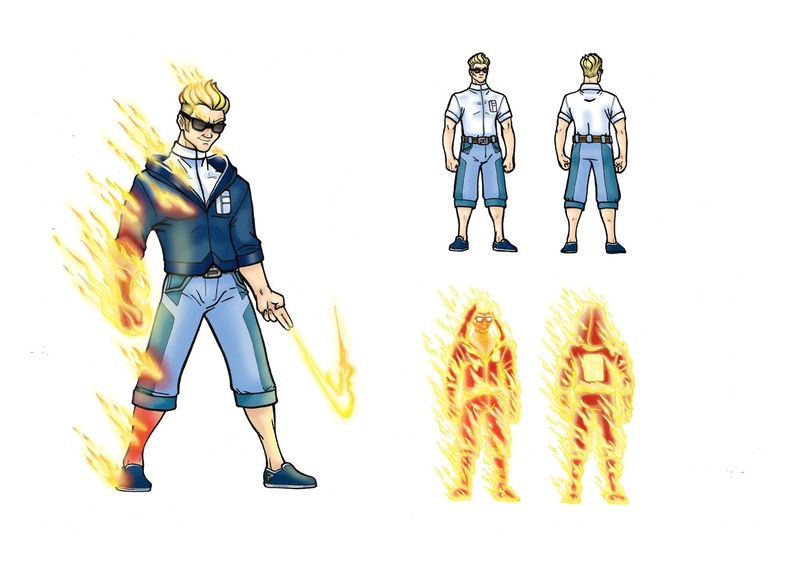 I also think that on Reed and Sue’s costume designs it resembles a VIP or Visitors badge, and on Johnny’s it could be a price tag. The variants below are just to show what can be done with it, but personally I prefer it as it is. And if you read all that, congratulations! You deserve a cuppa! I do really appreciate it though, I’m gutted this never made the competition and only a handful of people will ever see it – but them’s the breaks as our American cousins might say. At least this way I can afford food, right?